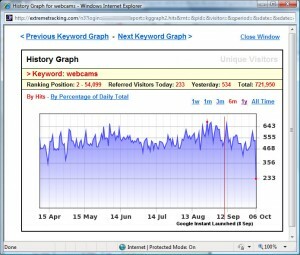 Patrick Cornwell (.com) » Blog Archive » Google Instant – Banned Keywords Perhaps Not All They Seem? Google Instant – Banned Keywords Perhaps Not All They Seem? It’s been a little while since Google unveiled its ‘Instant’ search to much fanfare. If you’ve not experienced it, it may be because it has not yet fully rolled out to people who are not signed in to Google. Basically, when you type a search term into the Google search box, Google looks at its ‘Top suggestion’ for the letters/words you type, as you type them, and shows you the results for that query. So you can type simply ‘w’ and it decides you’d like to see the weather – presumably because the most popular thing people search for that starts with ‘w’ is the weather. 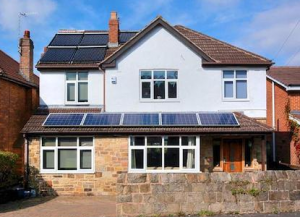 All the localisation still applies, which makes that particular example quite cool, giving me the weather in Sheffield instantly. However, if I type ‘wa’, I get Walmart, ‘wo’ the World Cup, ‘wh’ the White Pages, and suchlike. It figures out what you are looking for, before you’ve finished typing. 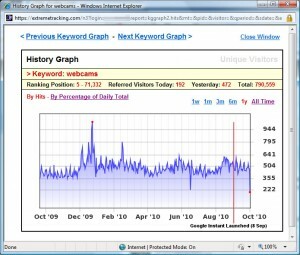 When it launched, the first thing I did was search for one of my more interesting keyword terms, ‘webcams’. You get as far as ‘webc’ and Instant is showing ‘Webcrawler’ as the result – type the next letter ‘a’ and you’re faced with a blank screen. Now, ‘webcams’ can clearly mean different things – i.e. your intention might be “I want to buy a webcam” so you type it in, to see what there is on the market. But it might be you want to watch some webcams, and as we’re all probably aware, along with the nice views of Loch Ness and Big Ben are hundreds of sites hosting ‘Adult chat’ type services. It must be this variation which is why the keyword is seemingly banned. The Google team explained on launch day that the censorship is to protect children from accidentally being faced with a raft of ‘dodgy’ suggested results. But in this case, the banning of a fairly innocuous term like ‘webcams’ (or ‘webcam’) seems illogical. In fact, even more so, when Instant works with the term ‘Web Cam’. 2600.com have published a ‘blacklist’ containing all the words so far they have found which results in the ‘Instant White Screen’ – you’ll find my contribution under ‘webcam’! Studying that and looking at the issue got me thinking. Clearly Instant is very much tied in with Search Suggestions, that is, those five suggestions you get as you type which have been a feature of Google Search for quite some time now. Is the Censorship ‘Blacklist’ led? Concentrating on a ‘blacklist’ of words is perhaps not the best approach to understanding Google’s censorship. It is clear to me (although I am theorising, it seems correct) that Google may also run a check on the potential suggestions rather than or as well as the words you are typing. Therefore if a good proportion of the searching public are looking for something naughty when their search term contains the word ‘webcams’, that would have naturally shown up as one of the suggestions, and hence the banning of the original term, to protect innocent eyes. This leads me to think that certain words may come ‘in and out’ of censorship as search trends alter, i.e. if Google does this sort of ‘Suggestion Check’ dynamically all the time, rather than launching Instant with a static lexicon of semantically linked terms. It’s worth saying that the term ‘webcams’ seemingly halted the Suggestions feature before Instant was launched too, so the ‘blacklist’ is nothing new in itself. I’m in two minds where I stand on this censorship. 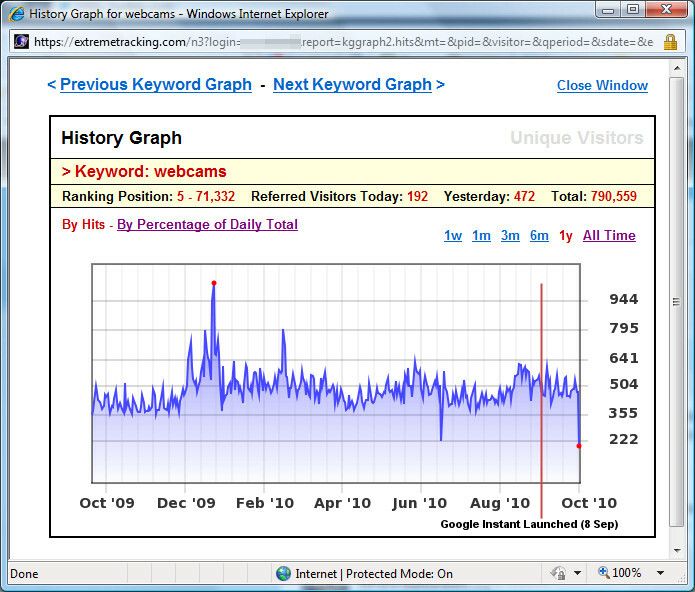 For me, it may mean that when people search for ‘webcams’ (as many do), they at least won’t be distracted by long tail additions that Google might suggest (and therefore potentially diminish traffic arriving at one of my sites), but on the other hand, a user who is used to Instant presenting results without the need for the ‘enter’ key may in time stop using Enter altogether and simply believe they have searched incorrectly and go back to try a different tack. It’ll be interesting to see, but for now because you still have to be signed in for the most part to see Instant, I have yet to see a discernable difference in traffic levels as a result of this. 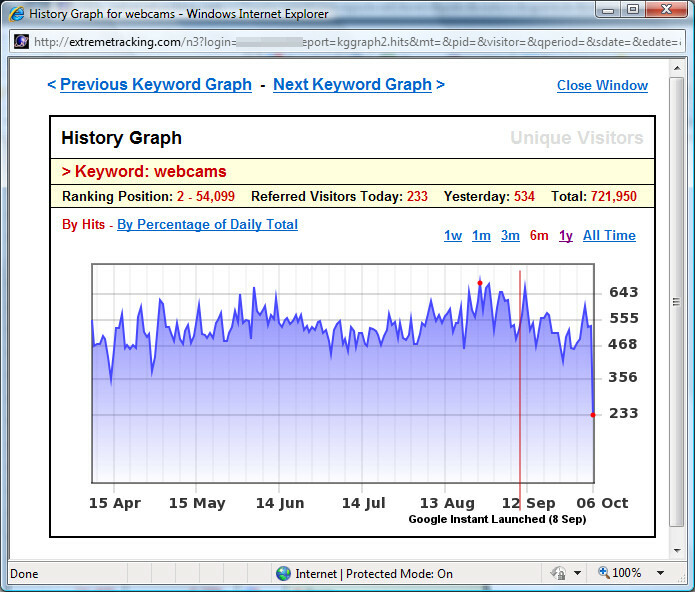 The above graphs are taken from two different sites, filtering down to just the word ‘Webcams’. All I see is the usual fluctuations so far, but then the traffic levels aren’t massive for this word on its own as you can see. It will be interesting to see what effect Instant has on this traffic when it rolls out to ‘signed out’ users in the coming weeks (as implied by Google on launch day). In the meantime, has anyone else seen a nasty trough for a single banned keyword since Instant launched?